Heat oven to 350°F. 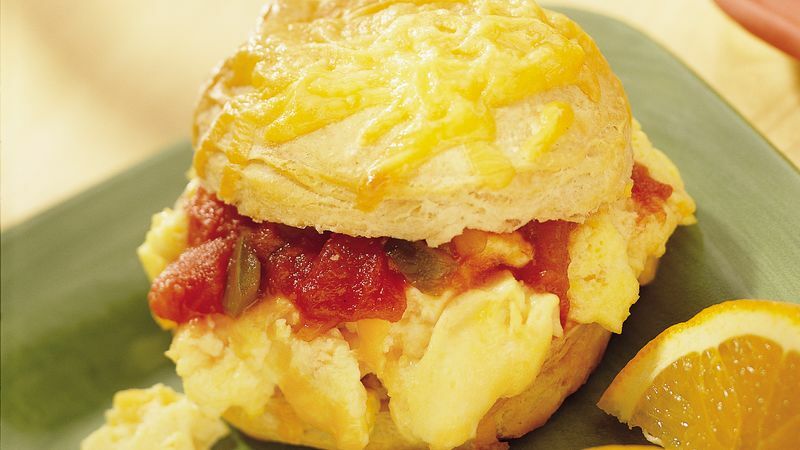 Prepare and bake biscuits as directed on can, sprinkling each with 1 tablespoon of the cheese before baking. Meanwhile, in large bowl, combine eggs, milk and salt; beat well. Melt margarine in medium skillet over medium heat. Add egg mixture; cook until eggs just begin to set, stirring occasionally. Stir in remaining cheese. Cook an additional 1 to 2 minutes or until cheese is almost melted. Split warm biscuits. Spoon eggs evenly onto bottom halves of biscuits. Top each with 1 tablespoon salsa. Cover with top halves of biscuits. If you wish, offer sour cream and chopped cilantro as a topping.